Mirza Ghalib born Mirza Asadullah Baig Khan was the preeminent Indian Urdu and Persian poet during the last years of the Mughal Empire. He used his pen-names of Ghalib and Asad. During his lifetime the Mughals were eclipsed and displaced by the British and finally deposed following the defeat of the Indian rebellion of 1857, events that he wrote of. Most notably, he wrote several ghazals during his life, which have since been interpreted and sung in many different ways by different people. Ghalib, the last great poet of the Mughal Era, is considered to be one of the most popular and influential poets of the Urdu poetry. Today Ghalib remains popular not only in India and Pakistan but also amongst diaspora communities around the world. His paternal grandfather, Mirza Qoqan Baig Khan, was a Saljuq Turk who had immigrated to India from Samarkand during the reign of Ahmad Shah. At the age of thirteen, Ghalib married Umrao Begum, daughter of Nawab Ilahi Bakhsh. He soon moved to Delhi, along with his younger brother, Mirza Yousuf Khan, who had developed schizophrenia at a young age and later died in Delhi during the chaos of 1857. 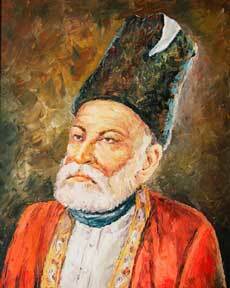 Ghalib started composing poetry at the age of 11. His first language was Urdu, but Persian and Turkish were also spoken at home. He got his education in Persian and Arabic at a young age. Although Ghalib himself was far prouder of his poetic achievements in Persian, he is today more famous for his Urdu ghazals. Numerous elucidations of Ghalib's ghazal compilations have been written by Urdu scholars. Before Ghalib, the ghazal was primarily an expression of anguished love; but Ghalib expressed philosophy, the travails and mysteries of life and wrote ghazals on many other subjects, vastly expanding the scope of the ghazal. This work is considered his paramount contribution to Urdu poetry and literature. In keeping with the conventions of the classical ghazal, in most of Ghalib's verses, the identity and the gender of the beloved is indeterminate. The critic/poet/writer Shamsur Rahman Faruqui explains that the convention of having the "idea" of a lover or beloved instead of an actual lover/beloved freed the poet-protagonist-lover from the demands of realism. Love poetry in Urdu from the last quarter of the seventeenth century onwards consists mostly of "poems about love" and not "love poems" in the Western sense of the term. The first complete English translation of Ghalib's ghazals was written by Sarfaraz K. Niazi and published by Rupa Co in India and Ferozsons in Pakistan. The title of this book is Love Sonnets of Ghalib and it contains complete Roman transliteration, explication and an extensive lexicon. Mirza Ghalib at the age of thirty he had seven children, none of whom survived. Ghalib was proud of his reputation as a rake. He was once imprisoned for gambling and subsequently relished the affair with pride. In the Mughal court circles, he even acquired a reputation as a "ladies' man".